When did you realize that the four-wheeled machine that you spin wrenches on, beat on, sweat over, bleed for and pay for with hard-earned money had become an institution to which you were faithful, no matter what? When did you realize that not only were you well past being the owner of a machine, but that you were well past “until death do you part” and onto the moment where not even death was going to keep you from enjoying that mass of metal, rubber, and chemicals? 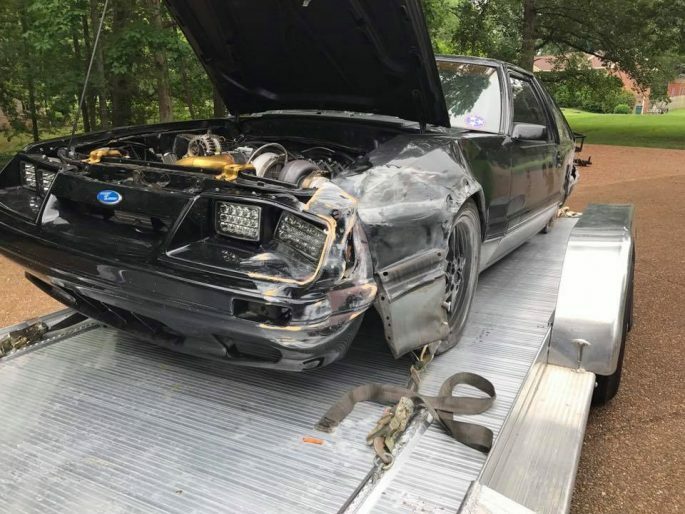 It’s not an everyday find…most people do have a finite point where the relationship between man and machine gets too painful, or too costly, or too stale and it’s time to move on, but we question whether or not James Rowlett and his “Boost of Burden” Mustang GT is in that hallowed ground. Let’s start the Mustang’s story on Drag Week 2017. A few miles before making it to a hotel in Illinois, a valve in cylinder #5 of the turbocharged LS mill dropped and proceeded to turn just about everything within the cylinder wall into a modern art piece. Not good. 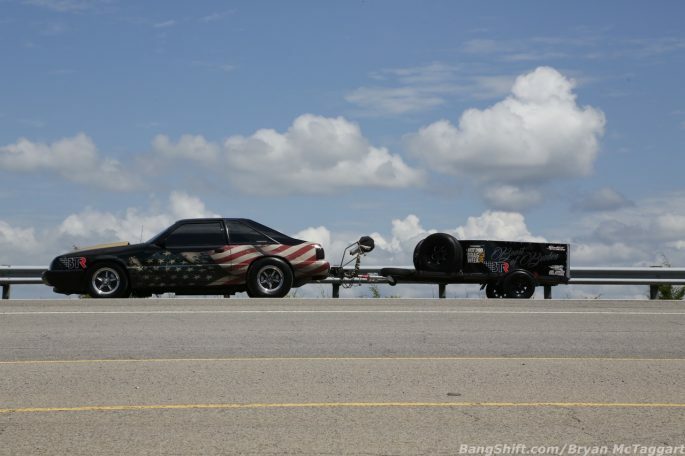 The car wound up being towed to Todd Bowers’ shop and left until Rowlett could return to recover the Mustang. That alone would’ve been enough for some folks, but that was inspiration to get the combination right for 2018. You’d think that would be enough of a kick in the junk, right? Let’s step to round two, which happened in June. 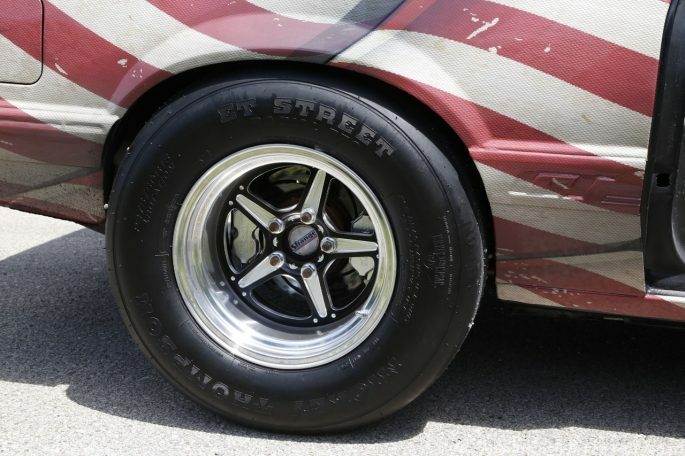 At an event at Crossville Dragway in Tennessee, the Mustang’s left rear wheel bailed from the program and the wall was kissed a couple of times. There wasn’t much else that could’ve been done, but the Mustang had been wounded. Rowlett still wouldn’t give up, and vowed to come back stronger than ever. Then there was the hood incident…one thing after another, it seems, but Rowlett is hell-bent that 2018 is going to be his year at Drag Week. 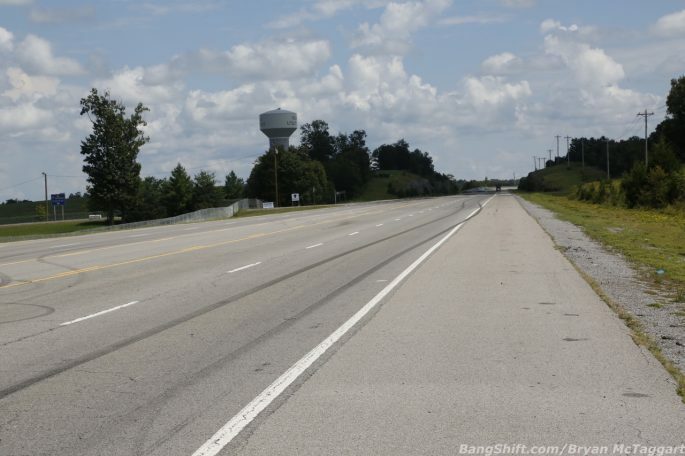 So let’s give you a run down on just what has been thrown at the Boost of Burden to get it ready for this year’s Drag Week. The mill is a 370ci LS build that’s drinking E85 via a Holley EFI setup. Goodies inside include Wiseco pistons, A1 Racing Parts rods, a Brian Tooley Racing Stage IV turbo camshaft, LSA heads with Brian Tooley Racing 660 dual springs and pushrods. The party piece is an 88mm VS Racing turbocharger with an air-to-water kit and a five-inch downpipe that Rowlett put together. Power runs through a PTC Powerglide with a PTC billet torque converter out to a Strange 9-inch with Strange 40-spline axles, 3.50 gears and a spool. Strange brakes can be found front and rear, and Strange also provided the struts and shocks. 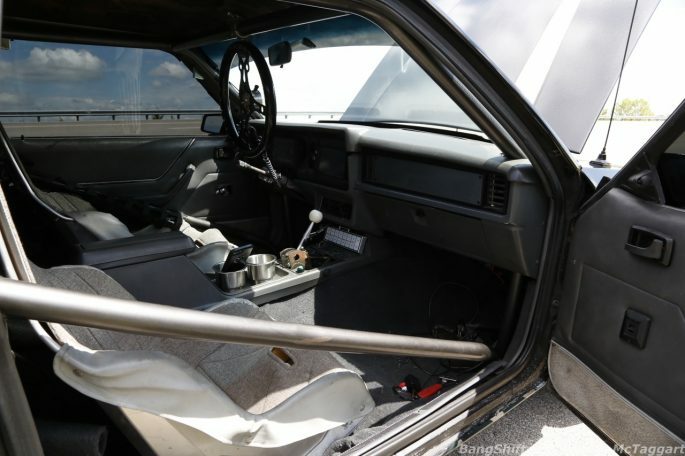 AJE Suspensions is the source of the K-member and the control arms up front, while out back Team Z control arms and an anti-roll bar handle what the road surface can dish out. The mill is fed via 210-pound injectors that are supplied via an Aeromotive Eliminator pump that is taking fuel from an Aeromotive 2003 Cobra fuel tank. And just to top off what is already going to be an pretty nasty ride, there’s the seven-inch screen that will control the tunes, the twelve-inch subwoofer in the back that is going to try like hell to override the engine’s noise, and the American flag wrap that was put on by Micah DeLozier. 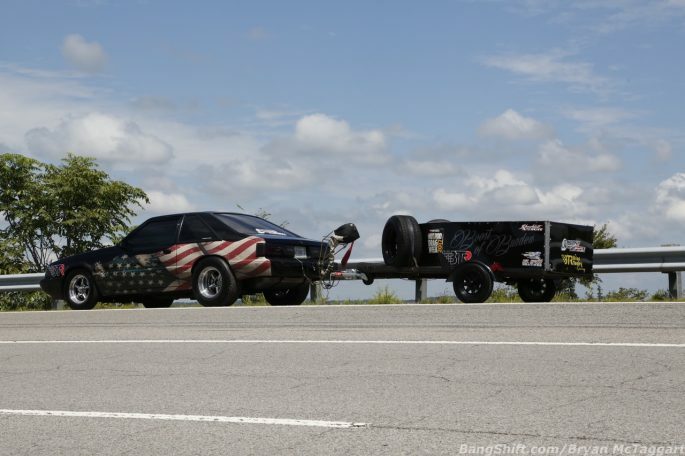 Together, you have Boost of Burden’s best foot forward for Drag Week, and I promise you, more than enough oats to play along all week…my request for a trailer burnout shot turned into Rowlett’s chance to really check out the Mustang’s tune, for what seemed like an eighth of a mile. It’s been a year of bona fide frustration and moments of anger at the 1985 ‘Stang, but the commitment is there, the pride in the car is still there, and come hell or high water, the desire to race this beast will remain. I admire James’s determination with the Mustang and wish him well with Drag Week 2018.